Are dark, sinister forces at work, the embodiment of evil, or is the narrator, Udo Berger, just losing touch with reality and experiencing the world through a cloud of paranoia? He is a German on holiday with his girlfriend Ingeborg in a Mediterranean coastal resort in the Catalonian region of northern Spain. While Ingeborg suns herself on the beach, Udo works in his hotel room on strategies for a board game called The Third Reich. He is an arrogant man, contemptuous of the frivolity of the tourists around him and full of self-importance over his reputation as a champion gamer. Udo and Ingeborg fall in with another German couple, Charly and Hanna, and through them with two Spaniards, the Wolf and the Lamb, who Udo tolerates rather than likes. He is also drawn to a badly scarred man El Quemado (the burnt one), who hires out pedal boats to tourists during the day and sleeps beneath them on the beach at night. Charly seems to be going off the rails, drinking heavily and getting in to fights, disappearing until one day he sails out to sea on his windsurf board and doesn’t return. As events unfold Udo becomes haunted by the notion that there is a guiding hand, or force, behind what is unfolding and is convinced that El Quemado is the personification of that force. Ingeborg and Charly’s girlfriend, Hanna, return to Germany, leaving Udo alone with the Spaniards and to begin a game of The Third Reich with El Quemado in which the stakes are never defined but which Udo becomes convinced will result in a terrifying forfeit. This “forgotten” novel by the late Roberto Bolaño was apparently discovered among his papers after the Chilean novelist’s death. It has a raw and unfinished feel to it, as if he were working out ideas, playing with tropes and styles, all of which more fully realized in his later, more mature fiction. 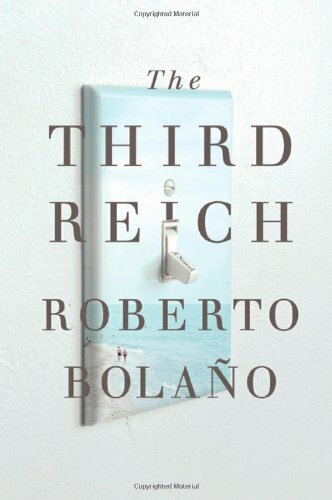 There are better Roberto Bolaño novels already out there, but The Third Reich stands up well and gives us an intriguing insight into how their author’s world view was informed by those better novels and the underlying sense of dread and tangible evil that weaves through them. Tony Bailie is an Irish novelist, poet, and journalist. His new novel ecopunks (Lagan Press, Belfast) was published in November 2010. An earlier novel, The Lost Chord, was published in 2006. He has published two collections of poems, The Tranquillity of Stone (2010) and Coill (2005). He spent three years living in Spain in the early 1990s, including a year in Madrid.